The IPPT went well, though I had some serious doubts earlier on as to whether or not I’d be able to achieve the Gold due to weather conditions, which was one of three things I felt were transpiring to prevent me from my gold achievement. The three things were: firstly, that I was suffering from what was probably the most intense sore throat I’d ever had, which prevented me from sleeping and eating well. Secondly, that the IPPT was pushed to Tuesday from Wednesday (I’d psychologically been readying myself for a Wednesday IPPT, which it was supposed to be on as of Sunday night and Monday morning; this would have given me an extra day to recover from my illness). And lastly, as mentioned before (and this was probably the worst), that the IPPT was being held at 4PM rather than in the morning, when the temperature would have been much more forgiving (I’d specifically trained for a morning IPPT). Other than the pull-ups where I felt a little soft, the other static stations went smoothly. Especially encouraging was the shuttle run where I ran to a very comfortable 9.1s, possibly my best ever and certainly one of the easiest, even though I was exhausted for a while after that (as I suppose would be the case with any anaerobic push). After the static stations I had anticipated a 20 minute cooldown before the 2.4. Unfortunately, it seemed that the stations were being handled slightly differently this time, and the cooldown seemed to be voluntary as opposed to mandatory. Within 5 minutes of submitting my 11B, my fellow runners and I were called up to prepare for the run. I was by this time still feeling the effects from the blistering 9.1s of the shuttle run, and would have preferred to have had a slightly longer wait. Nevertheless, I accepted what came my way and formed up to prepare to run. Thankfully I had, by this time, managed to douse myself with plenty of water, wetting my head in preparation for the heat that was to come. The sun was shining brightly, and had been for the past couple of hours. It was good that it rained in the morning, with the sky overcast till late morning and mid-afternoon. I suppose this might have shaved off at least half a degree of heat (an encouraging sign even if it could well have been insignificant, but I’d take all the help I could get), and it wasn’t until about 2PM that the sun had come out full-blast. Lining up for the run I readied myself by focusing on how the run was going to go – the last couple of days I played out how this run was going to go, where I was going to increase my pace, where I’d slow down, where the turns would be and how I’d handle runners in front of me. For my pacer I had my Timex – I didn’t trust anyone to pace me (nor did I trust myself enough to pace anyone else for that matter, though I was asked a couple of times). Right off the bat I sprinted off, though perhaps due to excitement, perhaps due to a lack of practice, it was most certanly too quickly. By the time I got to the supposed 400m mark, my watch showed 1:09. At 21 seconds off my target pace, I knew I had to slow down or risk early burnout. What was worse, by this time I was already feeling very tired; the heat was getting to me, and my throat wasn’t feeling too good either. I tried to slow down my pace, but was worried I’d slow down too much; so I maintained a hard pace but one slower than the one I had for the first 400m. At close to the 2km mark I shouted out to some of my men who were walking, “come on guys!” though I knew it was more for me than it was for them. Just after the 2km mark, I saw Dominic (a crazy army buddy) standing by, shouting me on, telling me that he’d pace me. I looked at my watch, and from my calculations I still had time (it was by now about 7+ minutes, and I knew I could comfortably go through if I maintained this pace and sped up just before the end). But Dominic would have none of it. He tried using scare tactics, telling me I wasn’t going to make it unless I picked up my pace; but I maintained my comfortable pace for a while. Then I tried to run with him, but I was getting plenty exhausted and worried I might fall out before the end. So in the next half a minute or so my pace was pretty indeterminate, as I wasn’t sure how far nor fast to push. His scare tactics though, were starting to scare me. In the end, as we approached the parade square, I picked up my pace and sprinted for the finish; not once did I slow down. I crossed the finish line at 9:43, faster than I’d anticipated, though slower than I’d have hoped (8-minutes, anyone?). Still, at the finish I felt like a King, and for only the second time in my life I managed to get the Gold. Multitasking and conversation don’t mix. 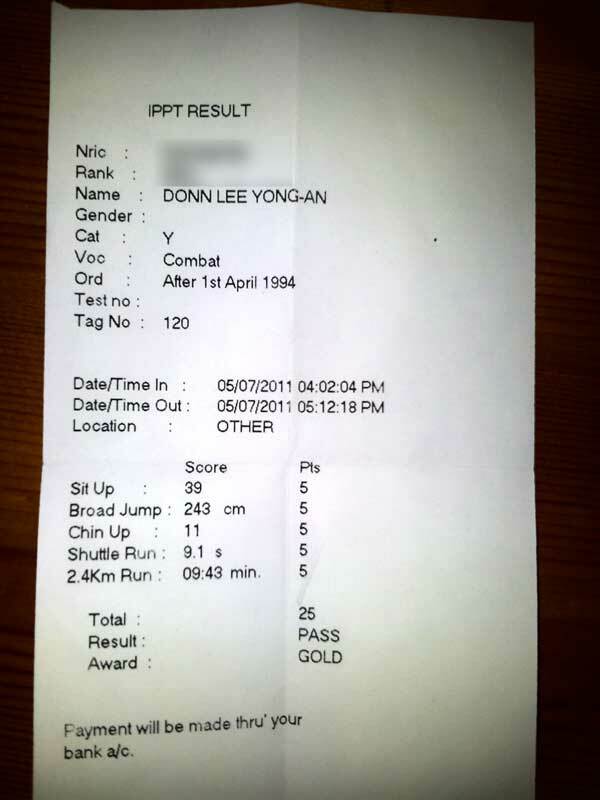 hi Donn, i happened to visit this web site and you had really made the mark of attaining IPPT Gold, i myself a SAF regular for 17 years and imagine for the 1st time in my career, i had attained IPPT Gold as i had shed almost 12KG of my weight as compared 6 months ago, i am just damn proud of myself when i don the Gold badge on my number 3.
maybe we can correspond with each other via email yah…. This one is 100% gold.